Excellent switcher. The only drawback I'd mention is that it is a pretty heavy gadget, but otherwise it works as you'd expect it to do so. - I have an amp head with 2 channels (clean / disto). - I have a pedalboard with 10 pedals. - I wish to have 3 different cleans (with a combination of different pedals for each). - I wish to have 4 different distos (with a combination of different pedals for each. - I want to have 1 "tuner" channel for just my tuner (so a single pedal). And so all this, with a product that can take into account and manage the channels of your amp head. Hmm hmm ... Impossible? In any case not Carl Martin! This programmable pedal (nothing digital, only analog and good old cable jack) is simply an invention of genius! - You wire all the loops (there is a 8) with your pedals. - You input the guitar through the input of the Octa-Switch. - You output the output of the Octa-Switch to the amp. 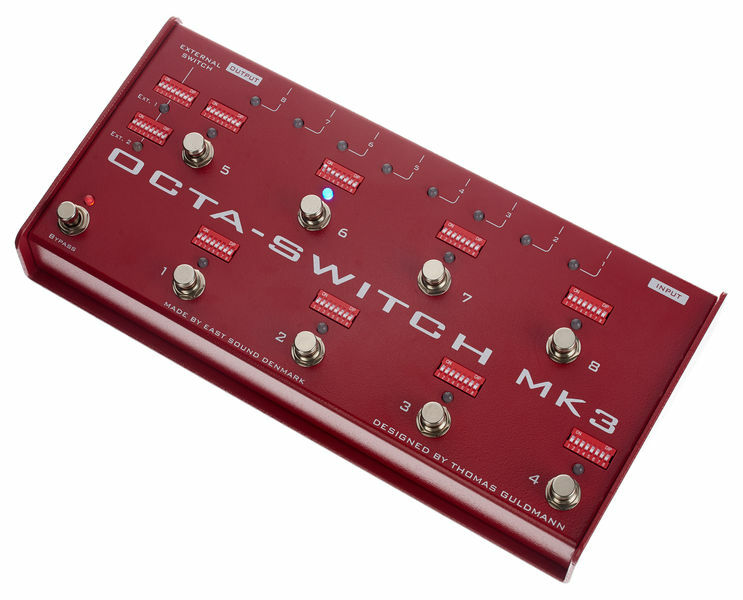 - You make your desired pedal combinations using the small Dip-Switchs on each of the 8 channels. - You buy a Y-type jack cable (with 1 stereo on one side and 2 monos on the other. - You connect the 2 monos to the external outputs 1 and 2 of the Octa-Switch, and you bracket the stereo in place of your footswitch of your amp head. - And now you only have to choose on the Dip-Switches of channels External 1 and 2 the channel that you want to have on your combinations of pedals that you have previously carried out. It's a breeze, really! Well, it makes custom cable jack a few times, but it's worth the effort! Believe me ! Combination of pedals (Compressor + Boost + Phaser). THIS PRODUCT IS MADE FOR YOU! ID: 365478 © 1996–2019 Thomann GmbH Thomann loves you, because you rock!